Final year end official stats are in and as expected, 2009 set all kinds of records. Every single quarter of 2009 was a transaction record, so it’s no surprise that the entire year set a transaction record as well. 2009 saw 16,260 single family home sales compared to 8,272 last year for a whopping 97% increase over last year. 2005 saw 12,123 home sales, so 2009 eclipsed that lofty mark as well, but this time it was done in a more healthy way, if you can believe that. 2005 sales were fueled by regular home sales and builder sales from previous years that took until 2005 to complete and close. We’re not seeing any builder sales, pent-up or otherwise because today’s home prices are well below replacement cost, so builders cannot afford to build today as they would lose money on each deal. So what’s different about 2009 vs. 2005? The main thing is housing affordability. At the height of the market single family home prices were about $322,000 and now they’re at $94,500. This makes it much more affordable for families that still have jobs. Obviously if you’ve been affected by the economy and a job loss, almost any mortgage payment is too much, so when we mention affordability we’re speaking to people who are blessed with a job. We also have low interest rates which positively affect affordability. Property taxes are lower which greatly reduces the monthly payment as well, further adding to affordability. 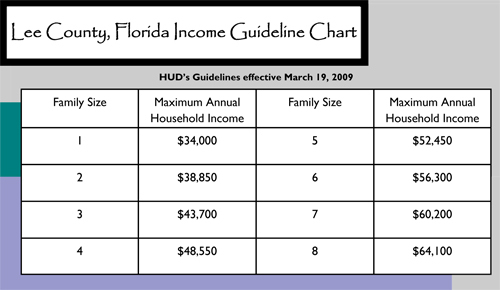 We still have a home buyer tax credit which is up to $8,000 for first time home buyers and $6,500 for existing buyers. Nationwide December sales slumped because Congress waited until end of November to extend and expand this credit, but we expect sales nationwide to pick up again. Locally sales were up 40% over 2008, so the tax credit expiration didn’t affect us much as everyone is trying to get in on these rock bottom prices. First time home buyers are in steep competition with investors for the best buys as well. 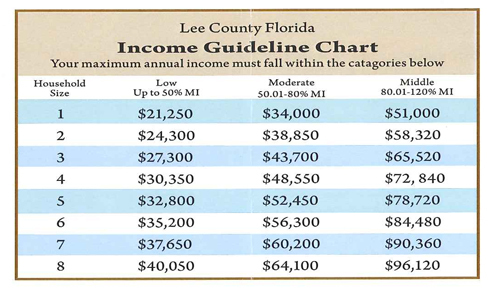 For years we would tell investors property in SW Florida just won’t cash flow unless you put a bunch down. This isn’t true anymore, so investors are coming in and scooping up these artificially low values and either renting them out for a positive cash flow or flipping them for a generous profit. Cash flow is the rent or income earned minus expenses, like debt service, property taxes, repairs, vacancy and collection losses, etc. In preparation for our annual State of the Market Report I started flagging several home sales that were flipped in 2009, sometimes a few times. Today’s prices are too low, especially at the bottom end of the market, and 2009 saw 5 of the last 6 months with rising median prices. We hear from our sources that there are more foreclosures on the way. Banks study default rates and can predict how many will foreclose in the future; because once a homeowner gets behind, statistically they don’t catch up very often. While the worst may be behind us, we believe we may have more to go. This fact and the job market should keep prices relatively stable until the economy turns around. We may see escalating prices going forward, and if so it will be because we are undervalued on a cash flow basis no matter what the job market is, but we believe true price appreciation will occur once the job market stabilizes. The commercial market is currently experiencing an adjustment similar to what the residential market has gone through in years past, as commercial tends to lag residential. This could put pressure on some banks, so 2010 may be a year to watch the banking sector for mounting losses on the commercial side. In the next few weeks we’ll have detailed analysis in out State of the Market report. You can view last year’s report at www.Topagent.com in the Housing Statistics section. We have additional graphs you can view there as well. We’ll be unveiling this year’s report online and on The Future of Real Estate show broadcast also on the website. Sales are off to a boom in 2010 with many sales contracts happening right now, so 2010 will be another fun year to track. We recently had a guest on “The Future of Real Estate” Video Show who opened my eyes on how to effectively test for Chinese drywall, and shed some interesting facts on the subject. To clear up a few myths, not all Chinese drywall is defective, and not all American drywall is good. Most of the problems associated have come from China though, thus the term Chinese drywall. Most people don’t really care how a car engine works, they only care that it works, and it gets them where they want to go. I won’t go into a lot of detail about how drywall is made, and that the tainted drywall was made with fly ash, a residue of coal combustion more commonly used in concrete mixtures. This scrubbing of the smokestacks emissions creates calcium sulfate, or gypsum, which can then used to make wallboard. American manufacturers gather the gypsum from the smokestacks after the scrubbing, which produces a cleaner product. There are no set standards by the Federal government, so it’s hard to even use the word defective in the proper light as there is no standard. People are concerned that defective wallboard gives off fumes that can corrode copper pipes, blacken jewelry and silverware, and possibly sicken people. Shipping records indicate that imports of potentially tainted Chinese building materials exceeded 500 million pounds during a four-year period of soaring home prices. The drywall may have been used in more than 100,000 homes, according to some estimates, including houses rebuilt after Hurricane Katrina. The drywall apparently causes a chemical reaction that gives off a rotten-egg stench, which grows worse with heat and humidity. The Chinese drywall is also made with a coal byproduct called fly ash that is less refined than the form used by U.S. drywall makers. Most of the drywall in question came into the country in 2006, following a series of Gulf Coast hurricanes and a domestic shortage brought on by the national housing boom. We found an innovative inspector who has been able to successfully test for a compound called Strontium using an X-Ray gun. This X-ray gun can test each board in a home which is important because a home may have some defective drywall mixed in with acceptable drywall. In the past, inspectors were forced to remove drywall or inspect air conditioner coils, plumbing, mirrors, etc. None of these inspections were guaranteed or scientific because at lower temperatures the effects of the drywall can be masked to some degree. 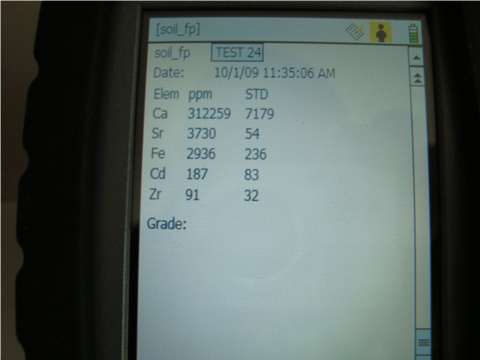 Visual inspection of corrosive metals and the unique odor of Hydrogen sulfide (H2S) are certainly signs of bad drywall in a home. 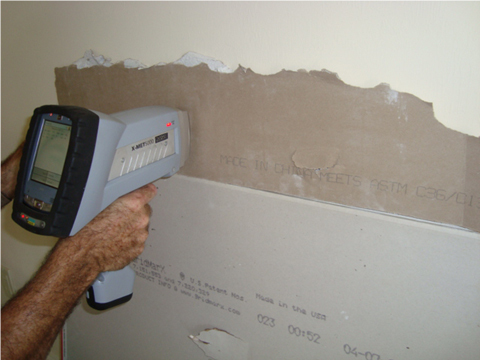 However, Drywall Science LLC is able to scientifically identify, using portable X-Ray technology (XRF), “defective” drywall from acceptable drywall by revealing high concentrations of strontium (Sr). This unique Sr signature for defective drywall was first reported by Unified engineering and later confirmed by the EPA and CPSC. There is also concern about “Off-Gassing.” Off-Gassing occurs when infected drywall releases chemical compounds and infects otherwise good drywall. The good drywall literally absorbs the bad chemical compounds associated with the defective drywall. Insulation and other materials may also absorb unwanted compounds, so simply removing a few pieces of defective drywall in a home may not cure the problem. Some experts say to effectively remediate a home, all drywall, insulation, and porous materials should be removed and replaced. The bottom line is it’s essential to determine if a home actually has bad drywall before considering remediation options. We’ve included a few photos so you can see what the gun looks like, and what the test results show on the gun. We are by no means inspection experts; however we were very impressed with this new technology and how it can scientifically look for defective drywall. If you’re purchasing a property, especially one built 2004-2008, or an older home that has been recently remodeled, we recommend an inspection. Jack Frost of Drywall Science LLC contributed to this article and has a patent on this X-Ray gun. While we are excited about this new technology, the Ellis Team, RE/MAX Realty Group, and the News Press in no way guarantees the accuracy or claims of this product. 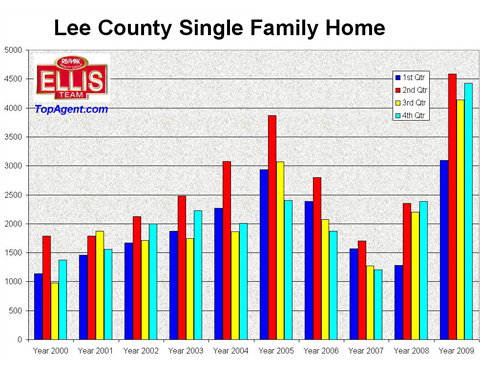 Each January everyone seems to ask what the new year will bring to the SW Florida real estate market. While nobody has a crystal ball, experience and detailed analysis lends clues to what the future may hold. Each year we release our annual State of the Market Report, which consists of the most detailed and current market stats around combined with our 20+ years of experience in the local real estate market. We pull these stats in January after agents have a chance to enter all their year-end transactions. We pull from a variety of MLS databases then merge the data together and eliminate duplication of data. Some listings are input and marketed to Realtors in multiple Boards, and we want the most current but accurate data free of duplication. This all takes time, and then the real analysis can begin. Fortunately we do provide a significant amount of data all year round to our readers and viewers of the weekly Future of Real Estate Video Show, so we can offer some preliminary data combined with experience and make some educated guesses as to what 2010 might bring. 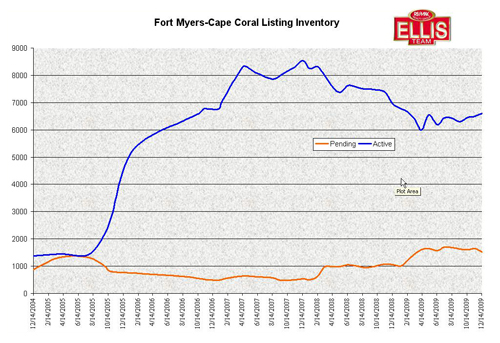 As you can see from the attached graph, listing inventory has been rising recently, and pending sales have started to fall again. We think this may be due to the anticipated expiration of the home buyer tax credit at the end of last November, but that has recently been extended and expanded into 2010. Not only can first time home buyers take advantage of this credit up to $8,000, now people who currently own a home and plan to but a new primary residence can also take advantage up to $6,500. Contracts must be in place by April 30, 2010 and must close by July 3, 2010. Add to this that our Northern friends are now here, and they are searching for homes. Word has gotten around up North that Florida is on sale, and prices have begun to rise in some sectors, especially the bargain buys. The Snow Birds realize 2010 may be the last “Season” to get these bargain basement prices, so they’re bringing their checkbooks looking to purchase. We wouldn’t be surprised to see pending sales rise in the next few months and inventory to fall again as Northerners help scoop up even more of our inventory. Investors have been hard at work in 2009 competing with first time home buyers, and we believe Northerners will be buying 2nd homes that they may one day move into, or vacation to at the least. The US Treasury Department has just issued new short sale guidelines which may make it easier to get short sales through for primary homeowners who are in trouble. This may help add sellable homes to the market, which could help increase sales and relieve some of the strain on foreclosures. Speaking of foreclosures, we believe much of the entry level speculation inventory is now gone, and we expect higher priced inventory to enter the market, which will make 2nd homes and move-up homes more attractive. As this occurs, look for more sales in the higher than median price range, which currently stands around $95,000. These new bargains at the higher price levels will help raise the median sale price. Speaking of sales prices, we’ve seen 5 straight months of median price gains, and we look for that to continue. In fact, early on in 2010 we may start to see year over year price gains, something we haven’t seen in about 4 years. In other words, February or March of 2010 may see higher prices than February or March of 2009. We can’t state the actual month it will occur, however if you study the graphs and data you can see that day looks like it’s coming fairly soon. Tune in to our weekly video show “The Future of Real Estate” at www.Topagent.com and stay tuned for our upcoming State of the Market Report which we’ll be releasing soon which will detail which areas of the county are moving, changes in averages sales prices, single family homes and condo data, and so much more. We’ll even break it down by zip code and graph it out so you can see how your area is doing, and what the future may hold. Stay tuned.